New Latvian pop duo Musiqq has released its debut album, Šī ir tikai mūzika, according to Rīga-based recording company MICREC. Musiqq consists of Marats Ogļezņevs and Emīls Balceris, who come from Liepāja. Musiqq has gained popularity with radio hits such as “Klimata kontrole,” “Abrakadabra” and “Dzimšanas diena,” all of which are included on the album. “The album from the first to the last song seems made for parties and this spring certainly will be an integral ingredient in every event with good friends,” according to a MICREC press release. The album was released March 25. Further information about the duo is available from Musiqq’s page on the social network draugiem.lv. 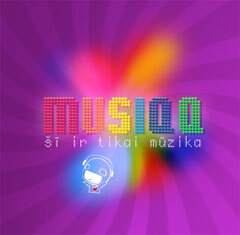 The debut album from Musiqq is called Šī ir tikai mūzika.